Good is evol once again, as we dive into another product from Evol Foods. This time, though, it’s pretty different from our previous parm mac and cheese. 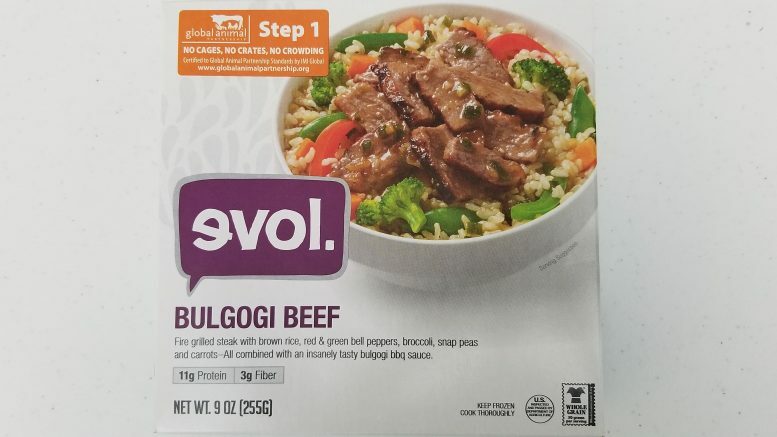 evol’s Bulgogi Beef box boasts (say that 10x fast) that there are no cages, crates, or crowding used on their animals. For those who might be concerned by how the farm animals used for their food are treated, the folks at Global Animal Partnership are there to help. This non-profit rates our beef in the meal at “Step 1,” which means no cages or crates were used. Plus, they’re never given antibiotics or hormones and fed a vegetarian diet. That doesn’t mean they weren’t fed corn, though. There’s a little more sugar than we like to see in this, but, I suppose you need that for the BBQ sauce. Speaking of the barbecue sauce, I didn’t taste much in there. So what is bulgogi anyway? According to this guy, it comes from soy sauce, sesame oil, sugar and garlic. It’s also been around forever. Like with the last evol meal, everything here is non-chemically sounding. Thumbs up for the ingredients, nothing weird or fake sounding, which is nice. While this evol meal was great, it wasn’t perfect. I opted for the option to cook it in the microwave, which got it in front of the camera ready to eat faster than the option of 60 minutes in the oven. The rice and vegetables had a good taste to them and cooked really well in the microwave. There was a significant amount of sugar in there from the barbecue sauce, which, since I couldn’t really taste it anyway, didn’t seem all that necessary to have. The rice was great, whoever’s in charge of churning that out needs a raise. The beef itself was kind of chewy, but given the type of beef this was, I half expected that anyhoo. It’s packaging doesn’t stand out and get attention, although the company’s reputation does a good job of that so the box doesn’t have to. I could pronounce all of the ingredient names and nothing sounded like it was made in a lab, thumbs up for that. *Ratings are on the basis of Above Average, Average, and Below Average. Always make sure beef products are 165 degrees fahrenheit before eating.